It has been a tough week for inept bank robbers. First, we had the story of the man who robbed a bank then returned to pay his overdraft. Then, we had the report of the robber who stood in the queue line with his mask on. Now is the story of an unidentified man in Nicholasville, KY who entered the building at 802 South Main Street. He pulled out a gun and asked the person at the counter to hand over the money. "We really don't have any money." said the clerk. "I know you have money. It's a bank." replied the robber. "No, sir, it's not a bank anymore." she explained. 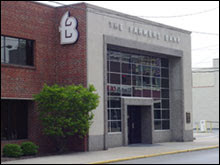 It seems the building at 802 Main Street used to be a branch office for Farmer's Bank. These days, however, it is the office of the local water district. They have nothing there worth stealing. The would-be-bank-robber's planning may have been lacking but at least his get-away was effective. He is still at large. pictured... the place he intended to rob.